(IEEFA, 8.Feb.2019) — The Argentine government’s plan to develop the massive Vaca Muerta oil and gas reserves in northern Patagonia has hit a major obstacle. The success of the plan requires the Argentine government to subsidize most of the development costs initially. But the Argentine government is in fiscal distress and has recently made it known that it plans to cut subsidies. As a result, the oil and gas companies whose involvement the plan depends on are reconsidering. The Macri government’s ambitious energy plan calls for doubling production of both oil and gas in five years, primarily through fracking at Vaca Muerta. To this end, the government is actively seeking foreign investment and partnerships. Since 2013, its majority state-owned oil and gas company, Yacimientos Petroliferos Fiscales Sociedad Anonima (YPF), has formed joint ventures with a global cast of oil and gas stakeholders that includes Chevron, BP, Exxon, Tecpetrol, Shell, Wintersall, Vista Oil and Gas, Schlumberger and Equinor, as well as Argentine-based companies like Pampa Energia. YPF, Pampa Energia and Tecpetrol have all stated that the change in the rules of the subsidy program will require them to reevaluate their investments in Vaca Muerta. Some are making formal complaints against the national government for changing the subsidy rules. Recently, labor unions and local government officials held a rally in Anelo to protest the proposed change. Part of the government’s promise in promoting Vaca Muerta has been to increase jobs. As many workers now face layoffs, this promise is in question. THE ARGENTINE ENERGY PLAN IS ALREADY MISSING ITS PRODUCTION GOALS. 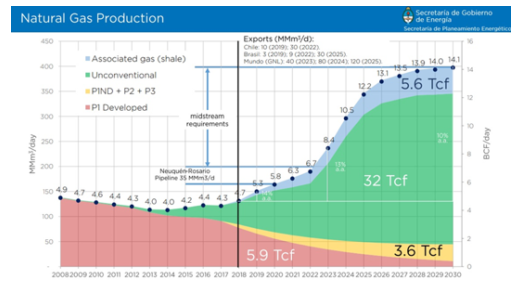 The Energy Plan calls for oil and gas production to increase by 14% in both 2018 and 2019, and to double over the next five to six years, as shown in the charts below. 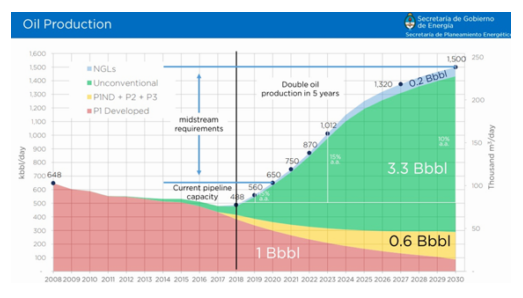 Most of the growth is expected to come from increases in unconventional oil and gas production, the area shaded in green in each chart. The subsidy cutbacks come on the heels of 2018, a year when production of both oil and gas was targeted to rise by 14%. During 2018, production levels were well below those goals. With the expected economic slowdown in 2019 and the announcement of the subsidy cutbacks, Argentine production is again unlikely to achieve its 2019 goals. Argentinian leaders have pledged to reduce fossil fuel subsidies as part of the recent cash infusion by the International Monetary Fund (IMF), which has agreed to lend the country $57 billion, the largest loan in its history. THE CHANGE IN SUBSIDIES UNDERMINES MARKET STABILITY AND INCREASES THE RISK FOR BOTH GLOBAL OIL AND GAS INTERESTS IN VACA MUERTA. And the subsidy cuts weaken the investment case among international oil and gas investors, who are already facing substantial losses globally. The oil and gas industry had the worst performance of any sector in the Standard and Poor’s 500 last year, following a decade of lagging stock market performance. New investments in oil and gas are likely to be near existing fields, with access to rail and ports, refinery capacity, safe waste disposal infrastructure, supplies and services. Vaca Muerta offers none of these much-needed resources and infrastructure. Add in fiscal instability and political disruptions, and oil and gas interests are likely to look elsewhere. YPF’s weakness is another challenge. The company has struggled financially. Last year, YPF lost more than half its stock value. Since the beginning of the year, the stock had recovered slightly, but lost 4% of value in the last week. Although Argentina is currently subsidizing the majority of the costs of development for its joint venture partners, the long-term plan is for those companies to take over the financial outlays and risk from the Argentine government. The pace of Argentina’s Energy Plan requires a substantial near-term outlay from the government, an outlay it cannot afford. The failure now — six years after YPF signed its first joint venture to develop Vaca Muerta — should cause the country’s leaders to rethink an energy plan that depends so heavily on fracking in Vaca Muerta. The country is unable to meet stated production goals. It has weakened its majority state-owned lead partner. And it faces rising disaffection from international oil and gas interests.